He Zhi Dao Tea Cup Set is suitable for green tea, display tea, jasmine tea, white tea, and yellow tea. He Zhi Dao Tea Cup Set comprises of a teacup and a multi-function tea tray. Each item is artfully made from Glass and Pewter. The tray can be opened up and acts as a tea canister. Canisters made from pewter are very suitable for storing green, yellow, white, scented and flower teas, being able to help preserve the freshness and fragrance of the tea leaves. 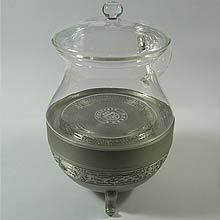 The lid is also made from Pewter which eliminates the common problem of broken lid.